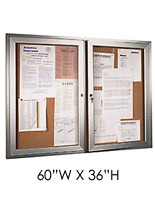 This Cork Board Has an Aluminum Metal Exterior and Three Aluminum Metal Framed Locking Doors! This Cork Board Is a Wall Display with a Fabric Surface! This Cork Board Is Ready to Be Bought! 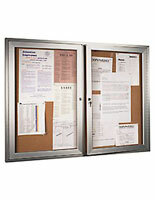 With this classic message center, cork board, you can keep everyone up to date on current events. 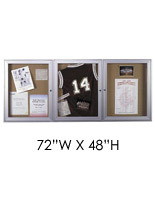 Each cork board is covered with grey fabric to conceal tack holes and accept hook and loop receptive fasteners. The inside of the cork board gives you 7/8" of clearance between the back and the swinging doors. The cork board doors characteristic shatter-resistant acrylic, full length piano hinges, locks and keys for added security. Four corner mounting holes are located on the rear of the display for the mounting hardware of these option (hardware not included). 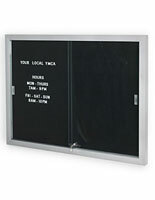 You must supply the mounting screws for this 6' wide x 4' tall cork board display. 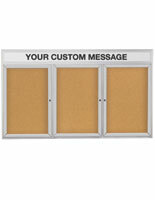 This cork board is perfect for exhibiting your notices and information in common places. 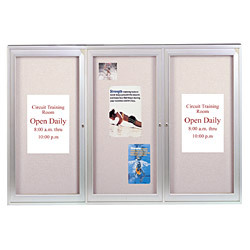 This cork board is usually seen in schools, firms, and government agencies. 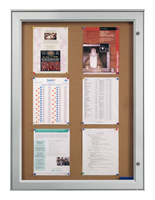 This bulletin board, cork board is also seen in hospitals, churches and state buildings. This cork board has a lot of room to post your subject matter. 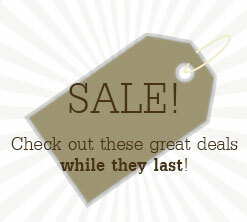 There are three distinct panels to permit the cork board to have one themed message, or three distinct subject matter.